Despite winning 15 games last season, Fairfield Prep was bounced out of the Class LL tournament in the second round by Wilton. FAIRFIELD - After winning the SCC tournament title last spring, Fairfield Prep had high hopes of using that momentum to make a deep run in the Class LL tournament. The Jesuits were bounced out of the Class LL race in the second round by Wilton and despite finishing with a solid 15-5 record, Prep coach Graham Niemi had to be disappointed. Will this season be better? Could be. Niemi returns seven of his top nine offensive players, led by Ethan Grandolfo (49 goals, 13 assists) and Mason Reale (23 goals, 25 assists). Grandolfo has committed to Air Force, Reale to Villanova. 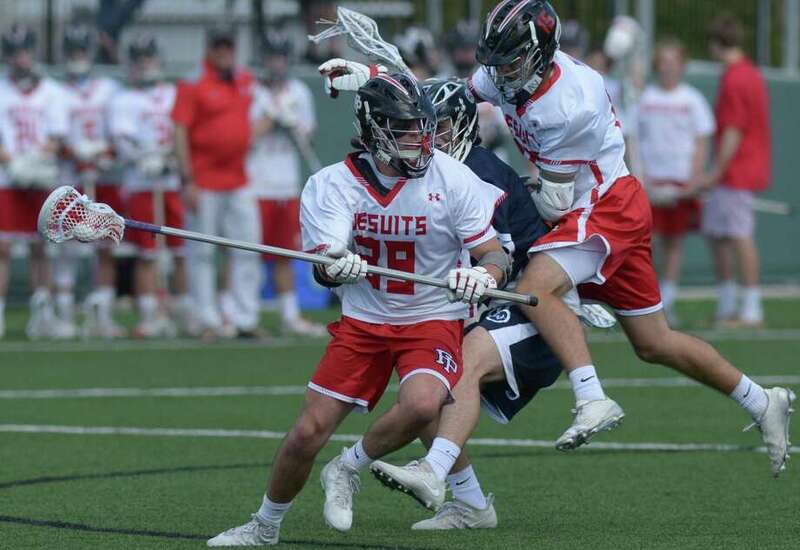 Reale, a junior attack, was a second team All-State selection as a sophomore while Grandolfo was a second-team All-SCC pick and led the Jesuits with 55 ground balls. Junior Peter Kavanaugh, was a second-team All-SCC selection at midfield, scoring 15 goals and adding 13 assists. Another junior, T.J. Walton, midfielder, scored 14 goals last season. He’s committed to Vermont. Another Vermont commit, Connor Boyle, a junior midfielder, scored 12 goals last season. Senior midfielder Jae Stuhlman, who has committed to Ithaca College, had 10 goals and six assists last season. Senior goalkeeper Matt Pinho - who was named the Most Outstanding Player in the 2017 SCC tournament - returns, as does senior defenders Justin Keith and Skyler Celotto, who was Prep’s top defensive midfielder last season. Stuhlman and Keith will be captains. Everyone knows that offense wins games but defense wins championships and Ludlowe coach Chris Parisi is banking on his four-year starter in goal, Carter Leibrock to anchor that defense as the Falcons look to qualify for the FCIAC tournament for a fourth straight season. Ludlowe finished 9-9 last season, losing in the opening round of the Class L tournament to Simsbury. The Falcons fell to Ridgefield in the quarterfinals of the FCIAC tournament. Along with Leibrock, Quinn Thompson, Max Chandler and Alex Berg, will be captains. Thompson will provide leadership from the attack position, after scoring 25 points last season. Likewise, Berg will bring experience to the midfield, scoring 20 points last season. Even better, the Falcons’ top two scorers, Aidan Wykoff (37 points) and Oliver Lay (30 points) both return. Junior midfielders Jeff Meyers, Austin Russell, Brendan Larson and Andres Klienbeck, who combined for 26 points, are back, as are senior defenders Josh Evans and Sawyer Coseglia and junior defender Jack Owens and sophomore Evan Rose. After finishing with a .500 regular season record (8-8) and not making the FCIAC playoffs, coach Tom Cunningham is looking get the Mustangs back into elite status and get them playing into June. All-FCIAC East performer senior Ted Orben, is back, along with another All-FCIAC East pick, Jack Murphy. Returning All-FCIAC Honorable Mentions include sophomore Blake Epstein, junior Charlie Richard and senior Chris Montenegro. Curtis, Montenegro and Murphy will be captains. Also returning for the Mustangs are senior Jack Curtis and sophomore Charlie DiGiacomo, who missed last season with an injury. Overall, the Mustangs finished at 8-9, losing in the first round of the Class L tournament to Newtown. After posting just three wins last spring, there is nowhere to go but up for the Lancers and coach Frank Skawinski. Seniors Brad Mazzone (attack), Chris Becker (midfield) and Kris Shkreli (defense) will be captains this season. Other returning players include: sophomore Charlie Goodrich (attack), sophomore Dalond Bidonne (goalie) and senior Kyle Pavone (midfield). “We graduated a heavy senior class last year, so far this season the new senior class has won over the locker room and have the young players buying into all the changes,” Skawinski wrote. “We need Mazzone, Becker and Shkreli to continue to do their jobs both on and off the field as the players figure out and adjust to their roles. The Lancers finished with a 3-13 record last season and did not qualify for the postseason.